Whatever strategies and funky innovations private radio stations come up with, they will always be dwarfed by the grand daddy of radio broadcasting. And by that I mean AIR. Ia��ve personally had many years with the national broadcaster and ita��s a totally different world. Ita��s more like an ashram, where everything has a particular pacea��yes, it takes some getting used to. But once you fall into the rhythm, ita��s a pleasant flight on-air. Ita��s great to know that the national broadcaster is getting a lot of a�?ear drumsa��. Prime Minister Narendra Modia��s fortnightly address has suddenly lit up the AIR skyline. Ita��s probably the best story on brand revival of this decade. Back in the 80s, when AIR was a part of every home, it was the superstar of the soundscape. The arrival of private FM stations made the listeners flock to different options, but now those very same listeners are back to hearing what the leader of the nation has to say, from a radio broadcasting network that covers 90 per cent of the countrya��s population as against 60 km in a city. You now know who the real boss of broadcast is. The amount of listenership that AIR has garnered with the address to the nation is something private FM stations need to think about. Yes, they cana��t do anything about it, but it should give them an image as to who they really are. Now that image, I shall leave to your imagination. So can AIR turn things around with their magic potiona��nationwide broadcasting? Yes they can, with a bit of tweaking as to how the programmes are produced and a fresh batch of presenters. And not to forget a broader mindset. Earlier, it was late Prime Minister Indira Gandhi and US president Ronald Reagan who rocked the charts with their consistent radio presence. They used national broadcasters because they wanted their message to reach each and every home. Now those times seem to be back and the onus is on AIR to make the best of it. 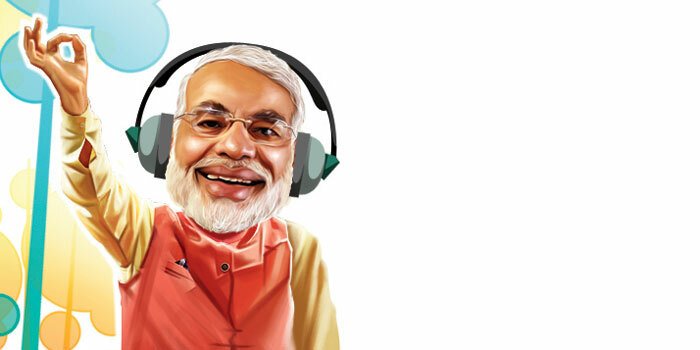 A new India with a newer All India Radio will be the perfect icing on the cake.